It’s been an interesting Mercury Retrograde so far, hasn’t it? Lots of old issues coming up for review, reassessment, and release. We often associate Mercury Retrograde with electronic or mechanical malfunctions or communication misfires or glitches. But think of the “re” in the word retrograde which means again, or redo; when a planet is in retrograde, it appears that the planet is going backwards in its orbit, which of course, it doesn’t actually do (this will explain: http://earthsky.org/space/what-is-retrograde-motion). To understand what retrograde means for us, think of some words that begin with “re“. Revisiting, reinventing, reassessing, review, release, renew, reconcile. This Mercury Retrograde (which ends May 3rd) for me has been about revisiting old patterns, particularly overwhelm and pressure (old familiar friends). The thing to do with all the old baggage that shows itself once again is to recognize it as old remnants of energy, breathe into the present moment and check in with what is actually happening right here and now, and then be willing to release with a sense of kindness and compassion for oneself. No matter what old pattern or way of thinking or behaving arises, we recognize and we release, with love, focusing on what is really true about the present moment. Remember, things rise up for resolution when we are filled up enough with good feeling to handle that rising up. Then we can use all of that good feeling that we have built up in our moat or reservoir to surround that old pattern in love. We have infinite capacity to love as our Higher Self because our Higher Self is infinite love. In our human form, we usually don’t remember this essential truth. My bountiful irises are blooming right now. Every year they remember how to bloom and every year they multiply and are more beautiful. They know and fulfill their infinite capacity without even thinking…. 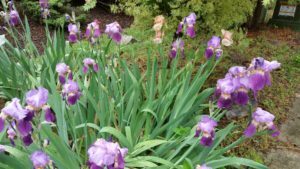 I aspire to be like my irises and rise up every year even more joyfully than the year before. I wish you the same.